Happy New Year! There has been lots of cooking and baking going on, so hopefully over the next few days I will put some posts together to share. I have tried quite a few new recipes over the past couple of weeks and some trusty old stand-bys. Yesterday, I checked Publix online for their weekly deals and saw “top loin” for sale – aka London broil. I have never purchased this up until now, but my mom used to prepare this cut when I was a kid so I was familiar with the name…that’s it! Luckily, TasteSpotting is an awesome website to use when I’m in the need for inspiration. I came across two new recipes via one link – I love when that happens. I have used this blog successfully in the past for new recipes, so I knew this blogger wouldn’t let me down. The steak had great flavor, and it would have been even better on a more expensive cut of meat. There is not a lot of fat marbled throughout top loin, so it wasn’t the most tender steak. Maybe next time I will look for a marinade with some kind of acid to tenderize this cut. The potatoes were so simple to put together and so tasty. I picked up a bag of those tiny, multicolored potatoes that Publix carries now for this dish and they worked out perfectly, and the skin is super thin, and became delightfully crispy when roasted. Thanks for reading, enjoy! Preheat oven to 400 degrees. Spray a 9×13 inch glass baking dish with non-stick cooking spray. 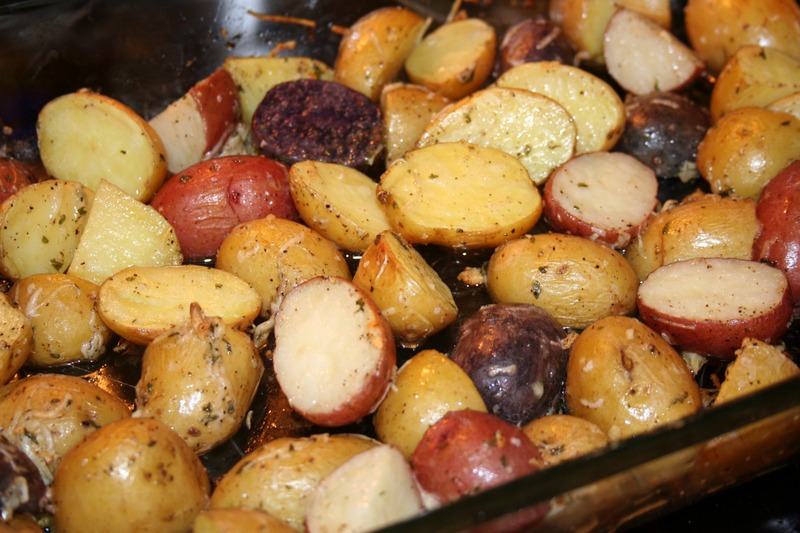 Arrange potatoes in prepared pan. Drizzle with olive oil, then sprinkle with garlic, parsley flakes, Parmesan cheese, salt and pepper. Toss to coat potatoes evenly. Bake for 25-30 minutes, or until potatoes are tender. Stir once half-way through baking time. Mix ingredients for marinade in shallow pan or zip-top bag. Score meat on both sides in a diamond-shaped pattern. Add meat to marinade and cover or seal. Refrigerate for at least 6 hours, or overnight. 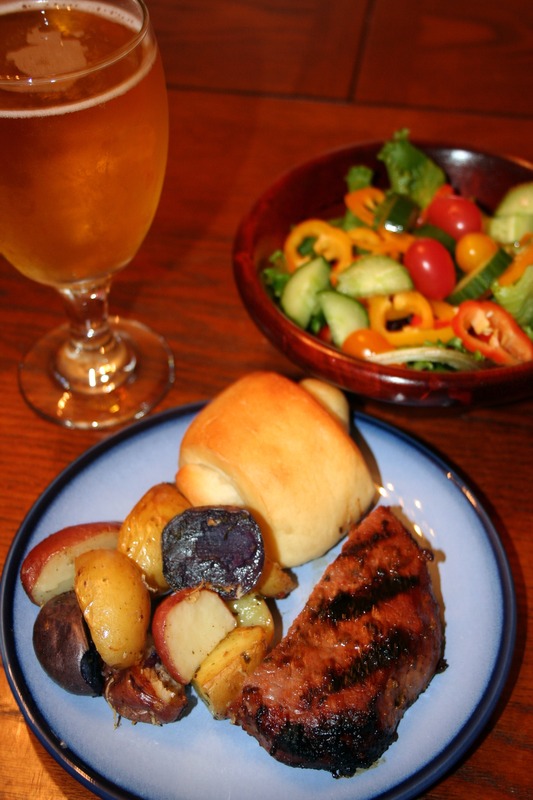 Remove meat and broil or grill to desired doneness, 10-15 minutes. Let meat rest for 5-10 minutes. Slice thinly across the grain and serve.